I’m not quite sure what I was expecting from Lloyd Eyre-Morgan's Shades of Diva. Accurately described as a musical drama, it was being performed in a converted shop under Afflecks Palace which is now Manchester’s funky new Three Minute Theatre. What I experienced was a refreshing and delightful reminder of the creative and dedicated passion people have for theatre, and the effort they will put in to make sure the show goes on, and that it's quality. 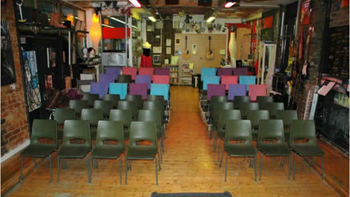 Three Minute Theatre is a small, intimate theatre that has a wonderful buzz about it, and although it is obvious that a number of the clientele are regulars, it has a warm, friendly and wonderfully inviting atmosphere. My wife, who continues to surprise me, said that it reminded her of a bar in on old TV series called Eldorado, not the actual look of the place, but the feeling and atmosphere of a community space where people drop in, relax and join in. The personalities behind Three Minute Theatre are clearly responsible for helping facilitate this, and the audience they attract are a credit to them and their efforts - people who live and breathe the Theatre. 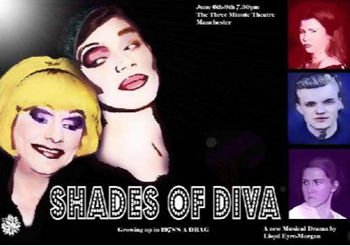 Shades of Diva is primarily focussed on the personal struggle a young man has with his own developing identity and sexuality. It is personalised through the character of Adam, originally from Manchester and living Brighton in the late 1970's, and his other self, the Drag Queen Diva whom he is becoming. Diva, is perched above the everyday proceedings of Adam's storyline and provides a reflective commentary to the audience on the feelings, emotions and dilemas Adam is experiencing. It's definitely a quirky and innovative way to narrate and contextualise the story-line, filling in the gaps in the estranged relationships Adam has with others. The all-knowing Diva looks back on what shaped his development with such delightful fondness, maturity and at times acerbic wit, such that almost everything happening in the main story is forgiven as simply shaping the desired and destined future. The separation of narration and verbalising Adams thoughts and feelings by Diva, worked well on the whole but became a little confused with the parts where Diva was reflecting back from the future, such that I felt the finger wagging, from the present, of Diva towards Adam's Mum rather than from the self-centred Adam, which didn't sit so well with Diva's character. Maybe it was the perching of Diva on Brighton Pier that gave this impression, but only a relatively minor aside, in case the production and script will be reworked before being performed again. So, the script develops with Adam being open with his friend Dylan about his dressing up in his mum's clothes to perform as Cher, Bette Midler, Dolly Parton and Barbra Streisand, who is really quite relaxed about the whole thing and wants to join in, even though his main love is football. This is in stark contrast to Adam's mum who tries desperately to hold things together as they were before splitting up with Adam's dad. Dylan provides the mechanism here to suggest that boys dressing up in women's clothes is an activity that should be embraced rather than feared, as a spoiler for the way Adam's mum reacts. No suggestion was made of where Adam's desire to dress up and perform as a Diva came from, except a general yearning to be a successful and commanding character in the limelight as his Diva idols were. Adam's working-class mum, Judy (Nicole Gaskell) was rather unfortunately setup in the script as an un-supportive mother, and generally rather sour and narrow minded, and not wanting to sound unfair, but the character was delivered chillingly well. She obviously loves her son but has a desire for him to be ‘normal’, just like other boys, such as Dylan appears to be. But his mother Judy has other ideas: such as the local football team. Adam and his best friend Dylan perform and dress up like the great divas, using Judy's clothes as costume in secret (including her knickers). One night Judy catches the boys and threatens to take Adam to hospital. There is a wonderful scene when Dylan comes downstairs in Judy’s clothes, complete with make-up, and his mum stares aghast and says “Oh Dylan!” – Now Dylan’s mum up until this point has been portrayed as being extremely open-minded and a bit of a ‘good time girl’, and I thought her reaction was one of shock, horror and that perhaps in fact she has been a bit of a hypocrite, telling Judy it is OK for her son to dress up but that when it is Dylan her own son – hmm. However, the shock, horror is then followed by “Oh Dylan, you look gorgeous”. What a wonderful moment and a hankie one for my wife! The ensuing argument between Adam and his mum sees the two boys run away to a drag club in Brighton, they are befriended by DIVA a wonderfully acerbic, funny and caring drag queen who takes the boys under her wing and teaches them everything she knows about how to be a star, a DIVA. Adam at first seems reluctant to get on stage and live out his (albeit short) life-long dream, whereas Dylan is straight up there on stage, eager and energetic, singing his heart out and lapping up the adoration from the crowd. It is particularly in this scene that the small intimate theatre comes into it’s own, where the audience feel and are actively encouraged to join in with the ensuing cabaret. We cheered on Adam, Diva and Dylan (who muscled in on Diva’s solo – and did actually win the hearts of the audience!). The music was classic 70s and everyone joined in clapping and cheering the entertainers on. 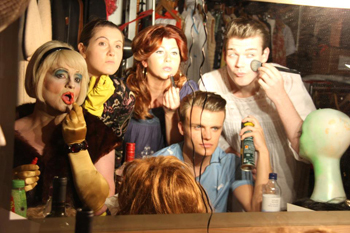 Yes it was a play, but at that moment we, the audience were at a drag club cheering on DIVA and little helpers. All ends well, with Adam and Dylan becoming a well suited couple, Diva moving on and the boys buying the club from her and making Adam’s dream come true – a DIVA. Evenutally Judy comes round and is happy for her son, and I loved the fact that the reunion wasn’t gushing or false; Adam was obviously still hurt by his mum’s rejection of who he really was, and Judy still not totally comfortable with her son’s sexuality. I can’t speak highly enough of the individual performances presented on stage. Adam (Jonathan Booth), Diva & Adult Adam (Lee Eakins), Dylan (Lee Peart), Judy (Nicole Gaskell) and Marion (Sophie Anne Ellicot) totally gave their all. Each and every one of them giving a believable and totally absorbing performance. The script was imaginative; the performances were delightful and honest; the production was full of personality; and the venue was a blast. At times during the performance you could hear a pin drop as the characters totally spellbound the audience, and twice during the play my wife (and a few others too) openly shed a tear during a couple of extremely touching scenes. All credit to the set designers (Tamara Higgs & John Topliff) who, working with an extremely limited space, managed to portray an authentic backdrop for Adam and Judy’s house and DIVA’s palace and make you feel part of the surroundings. If Manchester’s Northern Quarter can offer some more of this, then it’ll really develop a personality to match its creative tagging.